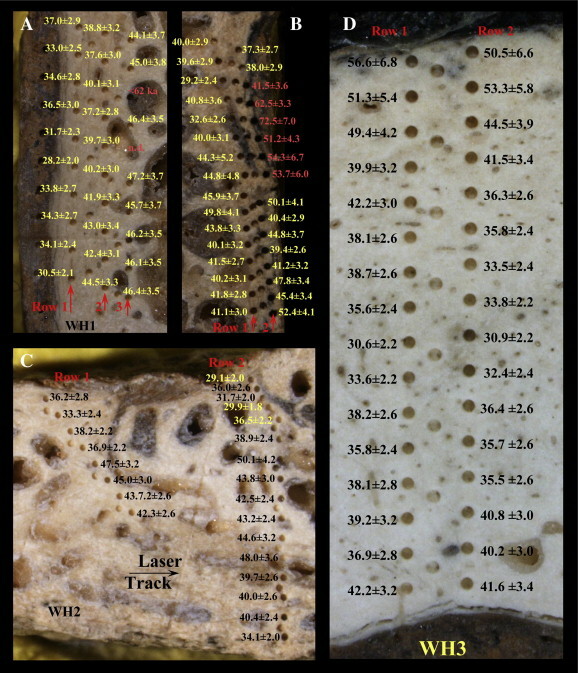 Laser ablation U-series dating results on human and faunal bone fragments from Wajak, Indonesia, indicate a minimum age of between 37.4 and 28.5 ka (thousands of years ago) for the whole assemblage. These are significantly older than previously published radiocarbon estimates on bone carbonate, which suggested a Holocene age for a human bone fragment and a late Pleistocene age for a faunal bone. The analysis of the organic components in the faunal material show severe degradation and a positive δ13C ratio indicate a high degree of secondary carbonatisation. This may explain why the thermal release method used for the original age assessments yielded such young ages. While the older U-series ages are not in contradiction with the morphology of the Wajak human fossils or Javanese biostratigraphy, they will require a reassessment of the evolutionary relationships of modern human remains in Southeast Asia and Oceania. It can be expected that systematic direct dating of human fossils from this area will lead to further revisions of our understanding of modern human evolution. Figure 1. A: Cranium and mandible of Wajak 1, norma lateralis sinistra. B: Maxilla and mandible of Wajak 2, norma lateralis sinistra. Figure 2. 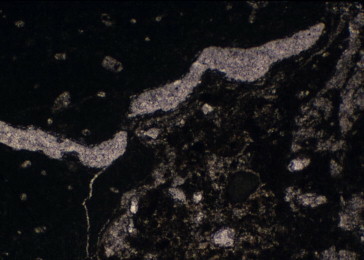 Section of human cortical bone (upper left corner) including a part of the medullary cavity (lower right corner) viewed under a cross polarizing microscope. The horizontal width is about 1 mm. Note the complete destruction of the osteons and their lamellae apart from the Haversian canals that have been filled by calcite. A thin layer of calcite has covered the outer and inner surfaces of bone (shown as a diagonal white line covering the endosteal surface, in the upper right). The cracks have been infilled by calcite too (white line on the left). No calcite has impregnated the bone matrix itself. The crystals of bone mineral have a random orientation. The medullary cavity has been filled by brecciated (calcified) clay (lower right corner). Figure 5. U-series age estimates on the human samples from the Wajak site. WH1 (A, B) and WH2 (C) are cranial fragments and WH3 (D) is a cross-section from the mid femoral shaft. No ages were calculated for the outer rim in 6A, which mainly contains sediment. Red numbers indicate contamination either from sediments or pore fillings. The other colours in the ages were only chosen for better contrast. Track positions in Fig. 6 are indicated by red arrows (For interpretation of the references to colour in this figure legend, the reader is referred to the web version of this article. ).